Karate, Kung Fu, Aikido Articles! Monster Martial Arts has just released a single volume containing 500 martial arts articles. The volume is a massive undertaking which took years to write. Consider that it has over 600 pages, and nearly 250,000 words, and one quickly realizes that it is one of the largest martial arts books ever written. It is even larger than many dictionaries. The instant download is nearly 6 Megabytes alone! The 500 articles were written by Al Case over the last half dozen years, and were intended to bring attention to his Monster Martial Arts website. That they succeeded is obvious, as the website has become extremely popular, as have the martial arts courses on the site. The courses cover a broad range of fighting disciplines, including karate, aikido, kung fu, pa kua chang, tai chi chuan, weapons, and more. The courses are designed to teaching one how to matrix the martial arts. Matrixing introduces a new form of logic which makes the martial arts easier and faster to learn. The 500 articles also cover a broad range of interests. Consider the following titles. 4 Bruce Lee, Jackie Chan, Jet Li: Who‘s the Better Martial Artist? 37 Download the Martial Arts into your Brain like Neo! 82 How to Tell if a Martial Art Instructor is Any Good! 124 Kung Fu Master…and the Secret of Light Kung Fu! 179 The Greatest Training Device in the Martial Arts Isn’t So Great! 250 I Beat Eight Ninjas in a Barfight Using Spetsnaz Karate Techniques! 346 Five Martial Arts Exercises Make You Five Times More Stronger, Faster And Powerful! 369 Tony Jaa Threatens to Kill Himself, then Becomes a Monk! 488 Is This the Most Powerful Punch in the Whole World? The release of the 500 articles coincides with the upcoming ‘Great Matrixing Tour.’ The purpose of the tour is to bring Matrixing to the Martial Artists across the United States. People who purchase the book will be contributing directly to the tour. I usually talk about Karate forms and applications here, or other stuff that is juicily violent, but let me move to an area that explains why we must be so violent. We must be violent so that we won’t be violent. Get it out in the dojo, and what’s left is peace in your soul when you walk around. But, it’s deeper than that. Let me go whole hog here, and explain the actual process that is working here. You have heard me say before: control the body to control the mind, control the mind to control the spirit. It’s true. But this is actually a condensation of the five circles surrounding a human being. You perceive, but what is it that perceives? It is the ‘I am,’ the awareness of awareness unit that is you. And you have dressed yourself with mind, emotion, body, and chaos. Chaos is fighting, that’s the outermost circle, that is the world. A buunch of idiots running around and threatening and shaking their fist and getting in trouble. Train the body and you instantly move out of chaos. You have a plan, an idea, and you are no longer subject to, or perhaps I should say victim to, the violence of a world gone amok. But, as you train the body you begin to gain control over emotions. You stop getting angry, you lose fear, and you start being happy most of the time. And when you aren’t happy you simply move through and get happy. Controlling the emotions is the start of controlling the mind, and now you are on the verge of controlling the world. The world, you see, will adhere to somebody who has control of their mind. Simply, the people who can’t control their mind look for some way to get their mind back under control, so they rub up against the sane. From the mind we move into spirit, and I’m going to stop explaining now, because once you get there you won’t need any explanations. The point here is that that is why you study the martial arts, not to beat people up, but to get rid of the desire to beat people up, and this has far reaching effects. Think about it, world peace by practicing your karate forms and elf defense moves. Now we’re talking. Drop by Monster Martial Arts if you want to dig into your sanity and learn the truth about the Martial Arts. The Secret of Real Karate Power is Fanaticism! I chuckle when I see these young kids train. They look so good in their karate uniforms, they are so proud, yet I wonder how many of them can be crazy enough to really learn the real martial art, and actually get some real karate power. Check out the vid, then I’ll tell you more. Look, if you want to saw a piece of wood, you don’t take a half a dozen cuts and then stop, you watch the cut, make sure it is happening right, and you continue, no matter how sore you get, until the wood separates. Now, if you want to break a brick, a simple trick, you simply set it up and start hitting it. And you hit it and hit it, and you focus on it until you don’t even see the rest of the world, and the brick eventually separates. Now, there is more to it, you want to be able to break that brick with one chop, but the message here is that you have to give yourself over to a fanatical mindset. You have to dedicate yourself, and do it and do it and do it, and have the firm knowledge that you will not quit, that you will squash any ideas of quit, that you will get where you are going. It’s funny, I see some martial artists from other countries, and they are actually a little more rabid than USers. Well, there mommie didn’t let them stay home from school if it was raining. She didn’t bring them milk and cookies and console them if the homework was tough…she told them to dry up and get the durned job done. That’s how it used to be in America, and thats why we achieved greatness. We can have greatness again, even if you were coddled as a school child. Simply dedicate yourself, be a fanatic. Tell yourself you are going to do that form a hundred times a day every day for one year,a nd then do it. Belive me, you will understand that Kata, and you will have abilities that you never even dreamed of when you were a lazy school kid. It’s up to you, but you have to give yourself over to fanaticism, and that is the secret of real karate power. If you want to learn more about this mindset, pop over to Monster Martial Arts and pick up a free book. It’ll tell you how to arrange your martial arts so the fanatical mindset can really bite. You know, Karate sometimes gets a bad rap these days. You see all the MMA guys trashing their opponents, and you wonder why, if Karate is so good, you don’t see it in the octagon. The reason, of course, is the problem with Classical Karate training methods. In traditional karate classes students are lined up in a mass, and they kick and punch and do everything as one unit. This is fine, for beginners. The sad fact, however, is that one rapidly travels through being a beginner, and then needs to have a different teaching method. Class exercises are fine to warm up, but there is no real exchange of information going on between teacher and student. Oh, you think that everything is in the forms, that you just need to do the forms and enlightenment will burst upon you? Well, true to a certain extent, but there is also the fact that if you hold to this opinion too hard you are saying that karate is for stupid people. Oh, I’m serious. Look, Karate, be it goju or shotokan or uechi ryu or whatever, depends on physics. And, once a person has mastered the first set of physics, there is a second set of physics pertinent to the mind and the spirit. But, because of antiquated training methods, methods that were used to control unruly children (not teach them) nobody in the martial arts really knows what the second set of physics is. Let me take one point and blow it up a bit. I had a student who had the most terrible form, and he had taken a year of classical martial arts training. He was terrible, but-smile in the eyes of his teachers-he was rigid. So his shoulders overextended, his body was always turned the wrong way, his punches wouldn’t hurt a six year old girl, but he was deemed good because he was rigid. All his muscles locked into place at the execution of technique. And, you can see this same tendency on any number of youtube Karate videos. Now, one of the first rules of combat is, ‘a sitting duck is a dead duck.’ Heck, the reason that bully told you to stand still and face him was because he wanted a stationary target. And this goes against the real karate somebody would learn if they could get past the rigid, no information instruction that is offered in nearly every karate class in the world. Real Karate is liquid, and the focus points are so short they can’t be perceived, and the karateka is able to move in any direction without preparation or telegraphing. True Karate is like a whip, and only the fist tightens, and that momentarily when it smacks through some fool’s face. Karate is a study in motion, not in rigidity, and that is just one of the problems with Classical Karate Training. If you want to see some excellent karate, check out my Temple Karate DVDs. I’m old, I’ve been doing classical karate for over forty years, but I’ve still got some liquid left in me. There are eleven forms, with TONS of self defense applications. 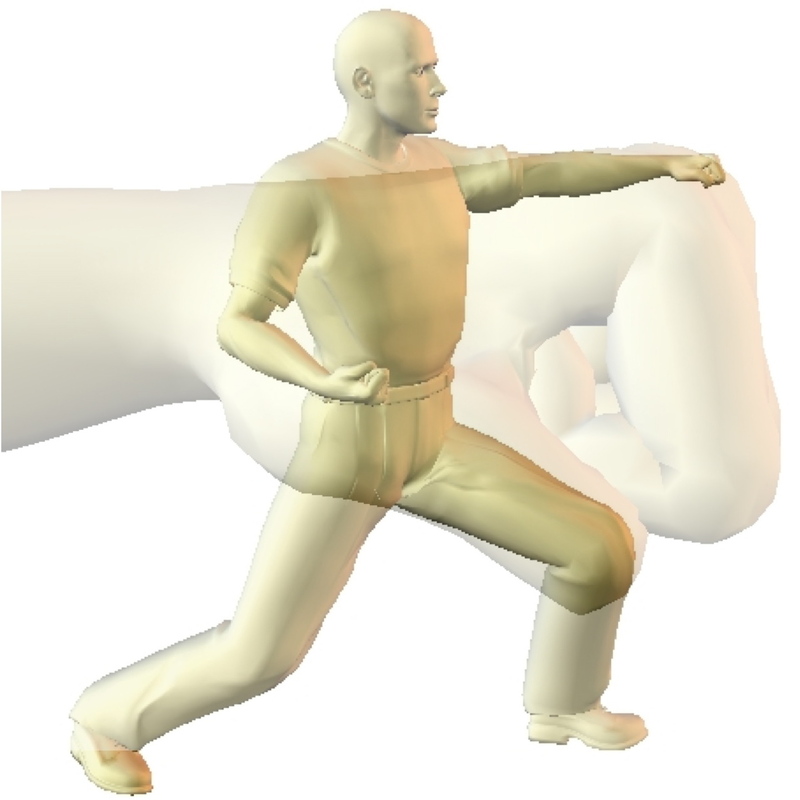 Analyzing the Iron Horse Stance in Karate! The Iron Horse Form is one of the best katas in Karate, and in all the Martial Arts. IT gives strength, power, energy, focus, and really makes you feel like you’re getting to the heart of the art. Here’s my version of it. Check it out, and then I’ll tell you more. To practice this you should loop it and do it in sequence maybe ten times. Don’t do it just once, keep doing it. Concentrate on the moment of focusing energy down, and letting yourself float sideways to the next position. Have the differences between these two things firmly in your mind. Have a partner and mirror each other. Critique each other, and get lower and longer and more explosive. Be twins in motion and structure. 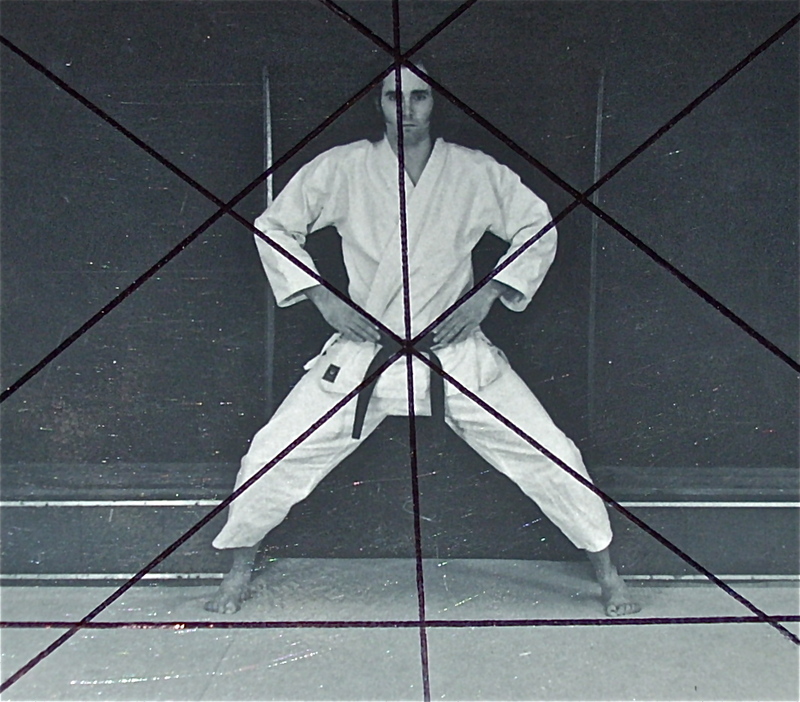 Practice just standing in the horse stance (called Kiba Dachi in Japanese). This is called Horse Meditation, and if you can hold the pose for just five minutes, you will have an immensely strong stance, and you will be generating tons of pure, raw power. Above all, do it every day. And, most important, look for applications,a nd practice those applications until you can make them work against anybody, and in situation or environment. Remember, when you do the horse stance you are gripping the ground, enabling yourself to move over slick surfaces, and this could mean on wet grass, oily cement, or even through puddles of blood, and yet still hold your balance and footwork. Drop by my site, Monster Martial Arts, and check out Temple Karate. I’ve got ten forms plus the one you see on this page, fully broken down and set for combat. Half a Year of Karate! Do you know how much you can get done in Karate in a half a year? The reason I say this is because the year is half over. So if you can remember what you were doing at Christmas, or New Years, and any resolutions or things, then you could have made a lot of things happen since them. If you are studying a classical art, you could have gone through a belt rank or two. You could have a couple of martial arts forms, had a ball doing lots of kumite, and generally be fit and healthy, and your mind would be calm. Now, if you had been studying my Matrixing program, you could actusally have your black belt by now. Serious. It’s a three month program, but it takes a lot of work. But six months is enough time to do a lot of work. So you could actually be there. And, here’s something interesting, if you slacked off a little the last few months, maybe been distracted by the news or something, you can realize that every moment you live and don’t do what you love is a moment wasted. Hey, if it’s not Karate, then what is it? Kung Fu? Yoga? Ballet? If you love it, then why aren’t you doing it? Got a dream? You’ve had six months to pursue it. Didn’t do it? It’s not too late, so get yer fanny in gear and get going! Don’t you understand? I’m telling you to ignore everything that gets in your way, everybody that slows you down or distracts you. I’m telling you that you should pick a goal, and having a black belt is an absolutely incredible goal, and GO FOR IT! Now, do you want to go waste another night drinking beer, or do you want to be somebody? Do you want to be strong and fit and quick in the mind? Okay, I’ve enjoyed this rant, and especially because I know it is so right and valuable. So spend the time between now and the end of the year working out and finding the real you. If I can help you reach your goals in Karate, if I can help you get to Black Belt, drop by my site, Monster Martial Arts. My email is there, and I answer all emails. See ya. The Secret Behind the Hardest Punch in the World! I remember reading that Chuck Norris had 600 pounds per square in in his kicks. I always use this kind fo data when trying to figure out the secret behind the hardest punch in the world, or the hardest kick, or whatever. You see, the idea is to get more weight in a smaller area. If you swing a mallet with a big head, maybe three inches across, you are putting weight to nine square inches. So if you put ninety pounds into your swing, and you get ten pounds per square inch. This dissipates the force, spreads it out, and weakens it. You swing a screw driver, and maybe put only thirty pounds in it, but the force is into an eighth inch square. That means 64 times 30 pounds, and you are striking with 1920 pounds per square inch! That’s why a screw driver penetrates, while a mallet flattens. Now, you think there would be more to it than this, and, you’d be right. You see, time also enters into the equation, and you’ll find that this has a lot to do with a punch. The longer the amount of time a fist is in contact with a target, the more some of that weight will go back up the arm. 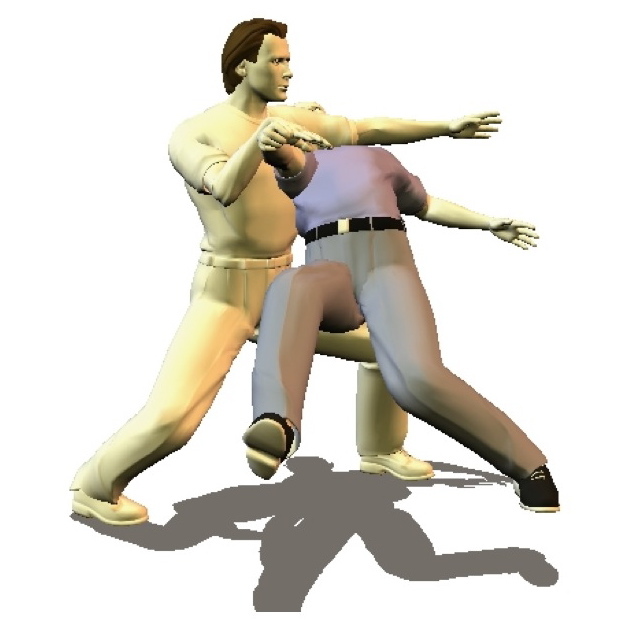 So, if you punch somebody and the punch is a thrust, and travels through, and is in contact with the striking surface (his face) for a long time–let’s say a full second, which is not real, but it is a good number to illustrate what is happening–then one second times 60 pounds of weight equals sixty pounds of impact. But if you are in contact for 1/2 second, 1/2 times 60 = 120 pounds of impact! And if you get down to 1/8 of a second, then you have 1/8 times 60, which equals 480 pounds of impact! The force of the punch, you see, has less time to travel back up the arm, and more weight is left in your poor opponent’s ugly face! Now, that is the physics, and that is the secret of the hardest punch in the world. All you have to do is understand these physics, and then do the exercises in The Punch (a book I wrote) and your punch is going to be able to knock down a freakin’ elephant! The physics are the secret, you see, but they are just the start. There is so much more to them, and so much you can do with them, once you understand them and what you are trying to really do with your punch. So check out The Punch at Monster Martial Arts. You’ll be glad you did. You are currently browsing the archives for the karate DVD category.